Tech Packs are just as important as your pattern and prototype when it comes to development, and for approaching factories with your production order. It's also one of the more confusing items to pull together for many new designers and brands. I will be speaking at the DG Expo in Chicago next week, with Jess Crane, on this very topic. Designers use a tech pack to get a sample or product made with minimal errors. A tech pack gives your contractors an instructional guide for your product, and serves as a "visual contract" during production. This seminar will discuss the elements that go into creating a good tech pack, including information needed for working with domestic or international production. 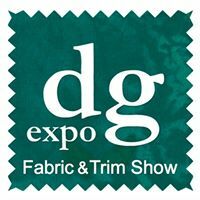 DG EXPO features a two-day Fabric & Trim Show for Designers, Manufacturers (producing Apparel, Accessories, Home furnishings, other Sewn Products), plus Private Label Retailers, Fabric Stores, Event/Party Planners. Register here to attend the show (FREE) and to purchase your ticket for this information-packed seminar ($18)! Come Meet Me at the Show! I will have a table at the show and would love to meet you! The Chicago Pattern Maker is sharing a table with Jess Crane Design and OnPoint Patterns. The Fashion Group International of Chicago will also have a table, and will be having a drawing for a FREE MEMBERSHIP! 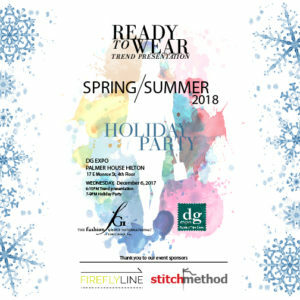 FGI is also hosting a holiday party on December 6th from 7-9pm, and playing a video Spring/Summer Trend presentation at 6:15pm. MORE INFO HERE. Check out this FREE toolkit I created for taking notes as you source new vendors and materials. Also helpful for post-show follow-up and to keep all your sourcing information organized during development.